Dr. Cassim is the director of pain management at desert orthopedic center (DOC) and chair of pain management at Eisenhower medical center (EMC). He is board-certified and fellowship trained. Dr Cassim practices interventional pain management. He earned his medical degree at NOVA Southeastern Medical School in Florida and completed his residency in Physical Medicine and Rehabilitation (PM&R) at the University of Minnesota. He continued on to complete his Pain and Interventional Management Fellowship training at the University of Minnesota, Riverside. Dr. Cassim then joined Medical Advanced Pain Specialists (MAPS), in Minneapolis, MN, where he collaborated on a multidisciplinary team treating a diverse group of pain conditions, focusing on spinal mediated pain. He specializes in comprehensive pain management and implantable therapies for pain. He also worked as a primary and subinvestigator for Medical Applied Research Center (MARC) with patient centered studies to help improve clinical treatment outcomes related to pain. 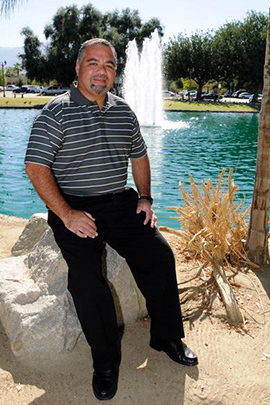 Dr. Cassim is pleased to make the Coachella Valley community his home and be a part of Desert Orthopedic Center (DOC). In his free time, he enjoys travel, fitness, spending time with family and friends and scuba diving. Meet Dr Haz Is a comprehensive care plan an option for you? How do epidural injections help you? What can cause neck and back pain? Arthritis in the spine - Can this be treated? How does nerve disease affect your body? Pain pills - Are they safe? "I sing his (Dr. Hazmer Cassim) praises to everyone. He's amazing. He's got to be one of the best doctors anywhere. I have a lot of faith in him." Tom West had nearly given up on ever getting any relief from the debilitating, chronic back pain that began before he was even 20 years old. “At 48, my spine probably looks like that of a 70-year-old,” explains West. West's back problems stem from spinal stenosis, a narrowing of the open spaces within the spine that can put pressure on the spinal cord and nerves that travel through the spine. Combined with spinal stenosis, osteoarthritis had caused some of West’s vertebrae to fuse together. "My back pain is due in good part to genetics and exacerbated by my active, physical lifestyle." "I exercise a lot more than the average person," West continues, adding that his exercise regimen once included riding a mountain bike 17 miles every other day. “In recent years, I've been pretty much incapacitated - sometimes my body would just lock up. After seeing many doctors and specialists who couldn't help me, I was beginning to think I would have to give up the things I like doing." That all changed when West met Eisenhower Physiatrist Hazmer Cassim, DO. Dr. Cassim, Board Certified Physiatrist (Physical Medicine and Rehabilitation) with additional certification in pain management from the American Board of Pain Medicine, focuses primarily on interventional pain management at Eisenhower Desert Orthopedic Center. He is an active member of the American Academy of Physical Medicine and Rehabilitation (AAPMR), American Society of Interventional Pain Physicians (ASIPP) and the American Osteopathic Association (AOA). After conducting a thorough examination and evaluating West's condition, Dr. Cassim recommended epidural injections. "These epidural injections, which are administered into the spine, contain a strong anti-inflammatory agent and an anesthetic for pain relief," notes Dr. Cassim. "They are given to relieve pain in the neck, back, arm and leg due to inflammation of spinal nerves from injury and conditions such as spinal stenosis, spondylolysis, herniated disc, degenerative disc and sciatica." "It works," says West. "I felt relief after three days. After the fourth treatment, I was able to ride my bike again - 10 miles my first time out. I'm doing a lot of walking and hiking, too." West commends Dr. Cassim's medical skills as well as the compassionate care, personal attention and time he gives his patients. "I sing his praises to everyone," West says. "He's amazing. He's got to be one of the best doctors anywhere. I have a lot of faith in him." In addition to the epidural injections, Dr. Cassim credits West's good attitude and perseverance for his positive outcome. "Tom is a wonderful guy and great to work with."